Today, a headline on Russia’s Sputnik News read: “Egypt to Join Russia-Led Eurasian Economic Union in 2016.” It’s a misleading claim — dispelled immediately in the lede, which says Egypt is working on establishing a free trade zone with the countries of the EEU. This development is less exciting than the headline, but serves as a testament to Russia’s relentless focus on building the EEU, naysayers be damned. Russia’s ongoing disputes with Europe and the United States over Ukraine has Moscow looking to firm up friendships where it finds them. TASS reported, after the deal was finalized, that in the first year alone the free trade agreement could save EEU exporters between $40 and $60 million. RT called the the agreement between Vietnam and Russia the “first international document on creating a free trade zone between the EEU and a third party.” This isn’t entirely accurate. The Commonwealth of Independent States Free Trade Agreement (CISFTA), which was put into effect in 2012, covers most of the CIS countries — including those which have not joined the EEU, like Ukraine, Uzbekistan, and Moldova. While the deal with Vietnam can be billed as demonstrating Russia’s increased engagement with Asia, the deal with Egypt more clearly illustrates Moscow’s need for partners. In trade terms, Russia looms much larger in Egypt than the reverse. Egypt is the world’s largest importer of wheat, needing an estimated 10.7 million tons in 2014. 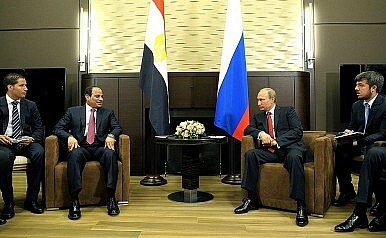 Russia amounts for $4.8 billion of all Egyptian imports, only coming after China and the United States. Last August, during Egyptian President Abdel Fattah al-Sisi’s visit to Sochi, Russian President Vladimir Putin said that Russia would increase wheat imports to Egypt to “at least 5-5.5 million tons.” He nonetheless then emphasized Egypt as a supplier of food products to Russia. “Egypt has already increased [agricultural] supplies to our market by 30 percent [and] is ready to increase [supplies] by yet another 30 percent in the near future,” Putin said. That visit came on the heels of increased western sanctions and Russia’s retaliation, which banned most food imports from the West. India, China, Tunisia, and Israel have all expressed some degree of interest in similar free trade deals with Russia. What the Belarus-Russia Border Tiff Means for ChinaReforming Customs, Uzbekistan Nods Toward the Eurasian Economic UnionRemember the Eurasian Economic Union?China and Russia in Central Asia: Rivalries and ResonanceWhere Did the Eurasian Economic Union Go Awry?